Plants that can hear themselves being eaten. Microphone-equipped drones that eavesdrop on sick chickens. Lasers that detect an insect’s wing-beats from dozens of feet away. In this James Bond-inspired episode of Gastropod, we listen to the soundtrack of farming, decode the meaning hidden in each squawk, moo, and buzz, and learn how we can use that information to improve our food in the future. Tune in now for this special broadcast of the barnyard orchestra! The idea that plants can hear and respond to music has a long and checkered history. Charles Darwin made his son, Francis, play the bassoon in front of a herb while he watched to see whether its leaves twitched (the plant was unmoved); Barbra Streisand caused a veritable explosion of color when singing to her tulips in the musical On a Clear Day You Can See Forever; and, as recently as the 1970s, UNC Greensboro physicist Dr. Gaylord Hageseth claimed that his experimental "pink" noise could make turnips sprout much faster. While the claims that playing Mozart in a cornfield will lead to a dramatic increase in yield have proved impossible to replicate, scientists are sure that plants do respond to sounds in their environment, with small changes in gene expression, for example, or slightly different germination rates. But, as Heidi Appel, senior research scientist at the University of Missouri, told Gastropod, "we never understood why plants would have that ability." Retired dentist George Milstein's 1970 album claims to help plants grow (you can listen to it here). 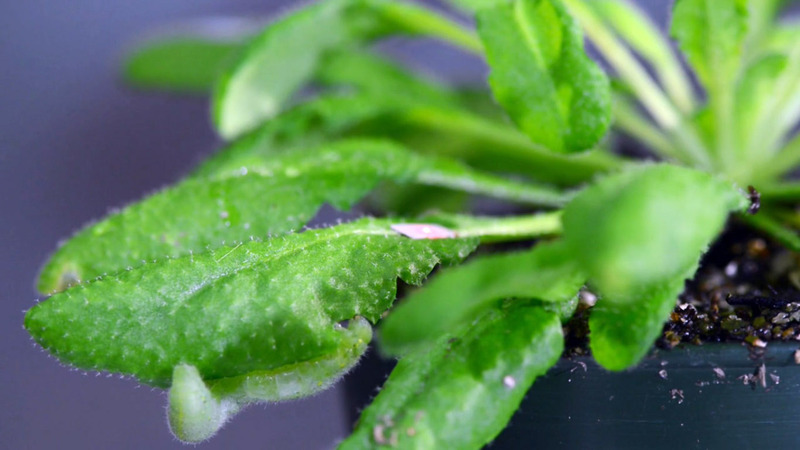 A caterpillar and laser on an Arabidopsis plant; still photo from a video made by Roger Meissen. But, as Appel pointed out to Gastropod, the use of sound might have an even more direct impact on our health. While plants evolved these chemical responses to deter pests, for humans, they often provide both flavor and health benefits. In fact, the sulfurous compounds produced by Arabidopsis and its fellow brassicas form the basis of America's favorite hot dog condiment, mustard. And those same chemicals are actively being studied by cancer researchers for their potent health benefits. Maybe, by playing predator sounds in the field, farmers could actually grow more healthful plants. Recording caterpillar munching; still photo from a video made by Roger Meissen. Appel is testing this hypothesis with an African plant that is currently harvested for medicinal use, to determine whether caterpillar feeding will increases the plants’ production of beneficial chemicals. If so, she can then test whether playing predator sounds has the same effect. “When we look at a plant as a source of flavor or medicine, what we are looking at is the product of millions of years of evolution of the plant interacting with its own pests—and those are largely insects,” said Appel. Insects that, it turns out, plants can hear. This is the first of a two-part series exploring the relationship between sound and food. Listen to this episode of Gastropod for much more on the experimental history and emerging science of acoustic agriculture, from the perfect bovine playlist to the lost rhythms of Southern farming. And, if you like what you hear, subscribe to make sure you don't miss out on hearing the difference between hot and cold tea, learning how the sound of tiny bubbles in soda changes its taste, and discovering the science behind pairing wine with music. If you're feeling particularly generous, you can also make a donation to help us keep going—thank you! Wayne Daley and Casey Ritz (professor of poultry science at University of Georgia, Athens) preparing to record chicken vocalizations. Photo credit: Gary Meek. As promised, we've uploaded all the odd sounds we played during the episode, so that you too can scare your houseplants with the sounds of caterpillars munching on leaves! From Heidi Appel, we have the infamous caterpillars themselves, the treehopper, and the sound of the wind. Richard Mankin's entire audio library is online, but check out the sounds of a German cockroach scurrying, an old house borer, a rice weevil, and its larvae at 17 and 18 days old. 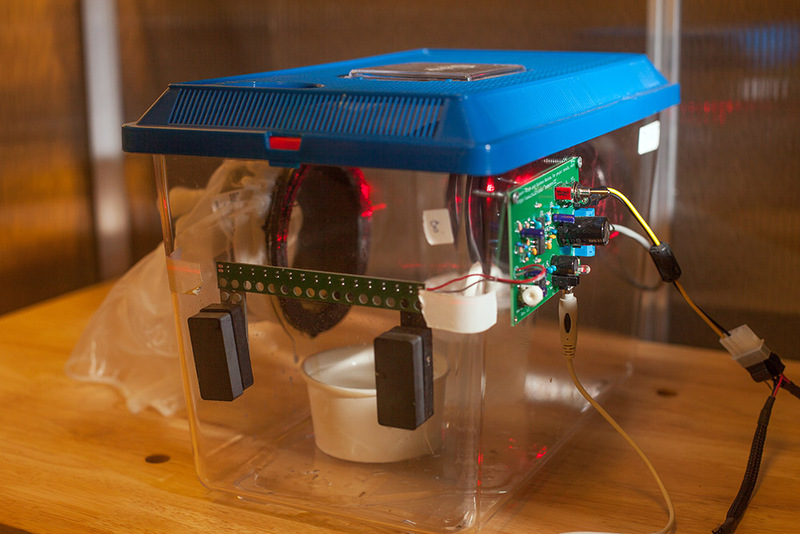 Eamonn Keogh shared a recording of several fruit flies passing the sensor, as well as a female mosquito. And Wayne Daley shared the squawks of sick chickens and healthy ones, for comparison. Mary Caton Lingold's Sonic Dictionary contains several agricultural sounds: we played a field holler, the sound of sugarcane harvesting, and the sound of a diesel tractor starting up. Heidi Appel and Rex Cocroft's 2014 paper, "Plants respond to leaf vibrations caused by insect herbivore chewing," is available online in the journal Oecologia. In a new study, published just a few months ago, Appel and her colleagues showed that plants can identify four different caterpillars and aphids through the different sounds they make while eating. For more, visit the Schultz-Appel Chemical Ecology Laboratory website. Nicky first discovered Richard Mankin's work when she tried to track down a mysterious CD, "Insect Noises in Stored Foodstuffs," that was listed as unavailable in the Aquarius Records catalog. Mankin, a USDA entomologist based in Gainesville, Florida, has placed his extensive library of insect recordings online, alongside his publications and other information on acoustic pest detection and control. Left: Audio detection for soil insects in 1951 (photo courtesy James Fisher and Richard Mankin). 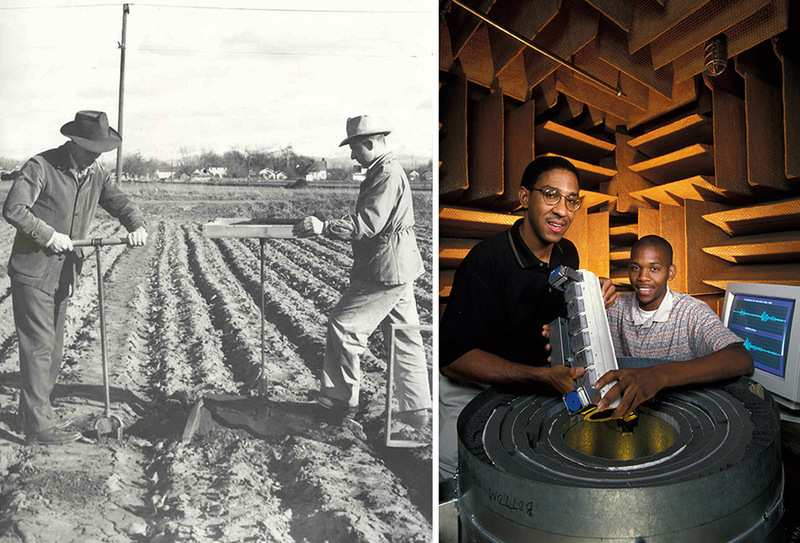 Right: Technicians Everett Foreman and Cornelius Dunmore holding an Acoustic Location Fingerprinting Insect Detector in an anechoic chamber (photo by Keith Weller). Eamonn Keogh's Computational Entomology lab at UC Riverside maintains a detailed project page on its insect classification system and published a report (PDF) on its findings in the Journal of Insect Behavior in 2014. One of Eamonn Keogh's insect sensor devices. Wayne Daley is a principal research engineer at Georgia Tech Research Institute Food Processing Technology Division. 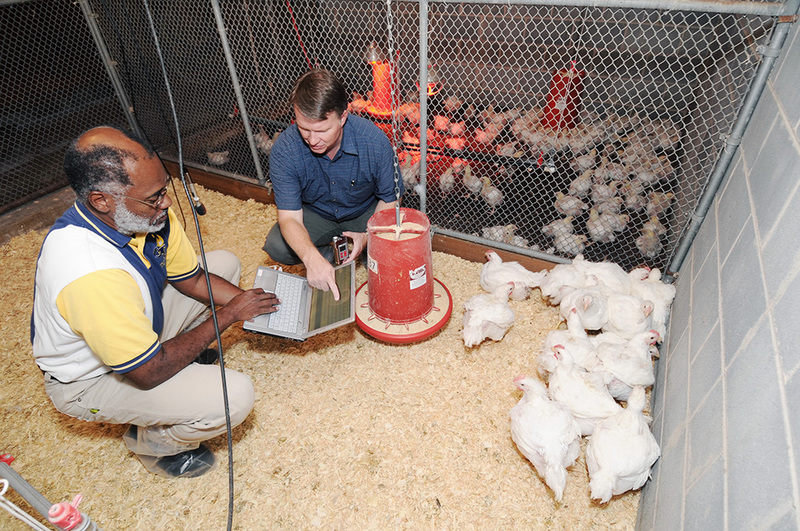 He and his colleagues published some of their research on chicken vocalizations last year in a paper titled "Classifying broiler chicken condition using audio data." 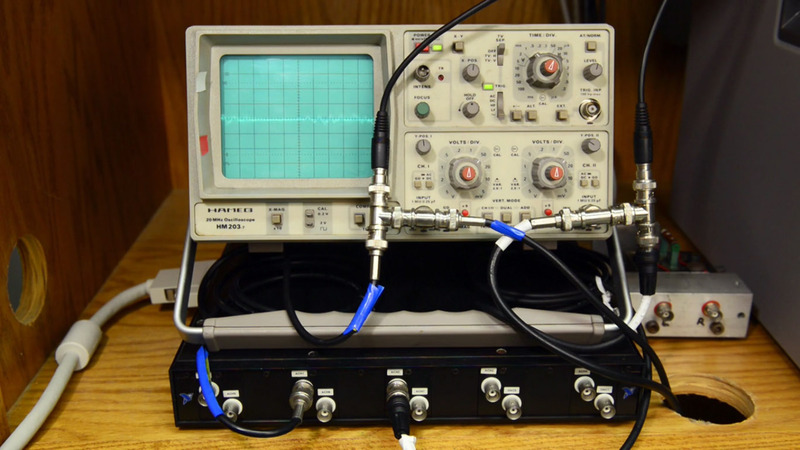 Mary Caton Lingold, a PhD student at Duke University, created this Sonic Dictionary with students while teaching a class on the "Sounds of the South."